The initial build covered England and Wales (Figure 1) and was funded by the Environment Agency of England and Wales (EA) in 2009–10 (Schofield et al. 2012). 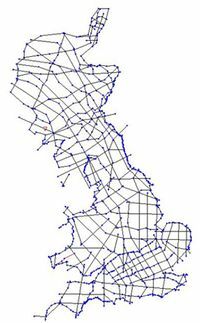 In 2010–12 BGS funded the extension of the network of sections to Scotland, whilst additional infill sections were added in England and Wales and cross-sections were aligned along the coast to give the overall model the familiar boundary of the British coastline. Sections in northern Scotland were continued across the Minch to the Outer Hebrides and similarly to Orkney, but the coverage has not been extended at present to include Shetland or Northern Ireland. In 2012 additional funding from the EA enabled a few further sections to be inserted in England and Wales, whilst many others were deepened in key sedimentary basins with potential shale gas source rocks. This was part of a project to design a risk screening tool for the possible impact of fracking on aquifers (Mathers et al. 2012a). The final model produced was the GB3D_v2012 dataset (Figures 2 and 3). This model covered the onshore area of Great Britain (England, Scotland and Wales) and the Isle of Man and comprised 121 cross-sections with a total linear length exceeding 20 000 km, built to depths varying between 1.5 and 6 km. Figure 2 The completed network of cross-sections for the GB3D_v2012 dataset. Figure 3 The completed GB3D_v2012 model from the southwest. At all stages the model has been constructed using the Geological Surveying and Investigation in 3D software (Kessler & Mathers, 2004; Kessler et al. 2009). 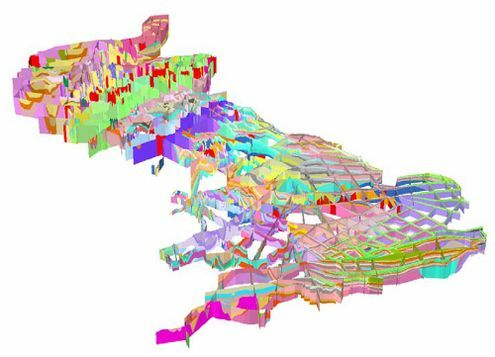 The methodology and sources used in the construction of the GB3D dataset have been thoroughly documented by Mathers et al. (2012b; 2014) and in this report. 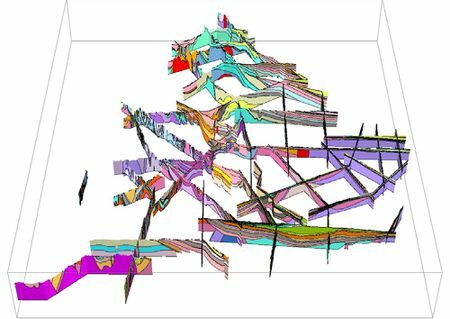 This study extends the GB3D_v2012 dataset by the incorporation of a few additional sections in England and Wales and the extension and realignment of many sections to include 305 deep stratigraphic boreholes (see Figure 4). Figure 4 Sections in England and Wales included in GB3D_v2012 release (red), those segments retained for the new GB3D_2014 model (yellow) and the completed framework including the new sections for GB3D_2014 (green). Note the section alignments for Scotland remained throughout as in Figure 2.